Since we only had white bread at home, I would be confused when I’d play at other kid’s houses and their mom served us wheat bread. Similar to when other mom’s served us their version of spaghetti; in my mind (and the mind of many of my friends), my mom makes the BEST spaghetti. It wasn’t until I was about 10 or 11 that I started having interest in accompanying my mom to markets and bakeries. As my knowledge of breads grew, sourdough and pumpernickel became my favorites. I tried a couple of bagels here and there but I did not like them. Bagels from the market were rubbery and tasted like plastic. Bagels from bakeries were way too chewy and sometimes too hard. It wasn’t until a visit to NYC with my BFF that I saw bagels in a new light. Perhaps its the magic and allure of NYC (a city that can do no wrong in my eyes), that suddenly made bagels delicious and satisfying. My BFF is a total bagel aficionado. He knew all the great places in the city that were bursting with customers and offered a plethora of bagels and cream cheeses to choose from. It totally changed my mind. I can’t recall the names of the places were tried but I do remember a perfectly toasted cinnamon raisin bagel smeared with just enough maple walnut cream cheese. I think we had bagels every day during that trip. I have yet to find bagels of the same magnitude in Los Angeles. There is something really special about New York style bagels. Since I can’t just fly to NYC every time I have a bagel craving, these homemade bagels are more than decent and worthy of the name. Making bagels takes some time, but its well worth the effort. It requires a handful of ingredients– just flour, salt, yeast, and water! Many home bakers are fearful of working with yeast because of bad experiences or failed baking attempts. Have no fear. When working with active dry yeast, the thermometer is our hero. Yeast needs the proper temperature to active and do its job. It is best to use warm water between 90-110 degrees F. Anything over 130 degrees F will kill the yeast and you’ll have to start over. Adding some type of sugar to the water-yeast mixture is also helpful. The sugar provides the yeast with food to stimulate activity and cause the mixture to foam and bubble, indicating that the yeast is alive and well. Once the dough has rest and risen, divide it into 8 equal portions. I like to use a kitchen scale to measure out the pieces and be more precise, but you can also do it by eye. My portions weighed out at 4 ounces each. Roll each portion into a loose ball. There are two ways to form the bagels. You can roll out the ball into a tapered rope and then pinch the ends together. Professional bakers usually prefer this method. I prefer the easier method of slightly flattening the ball and using my thumb to puncture a hole in the middle. 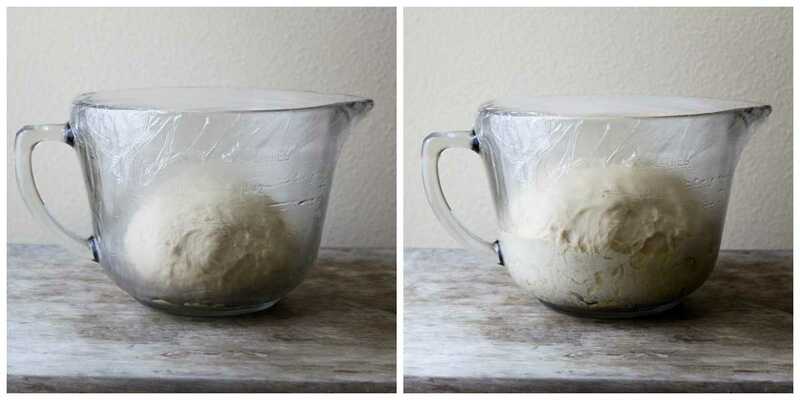 Holding the dough with both thumbs in the hole, gently rotate the dough and gradually stretch it until the hole is about 2 inches in diameter. After shaping the bagels, lightly mist them with oil or cooking spray. Cover with plastic wrap and let the bagels chill in the fridge overnight. The following morning, test a bagel in a small bowl filled with cold water. If the bagel floats to the top that means its ready to be cooked. If it sinks, the dough needs more time to proof. You can either let it rest at room temperature for 15-30 minutes or place it back in the fridge. Bagels are unique breads that are first boiled in water and then baked in the oven. This two-step process gives bagels its chewy interior and its shiny exterior. After the bagels have passed the float test, you are ready to boil them. The poaching liquid is a mixture of water, barley malt syrup, baking soda, and salt. The bagels spend about 2 minutes in the hot liquid and then get placed in a very hot 500 degrees F oven. 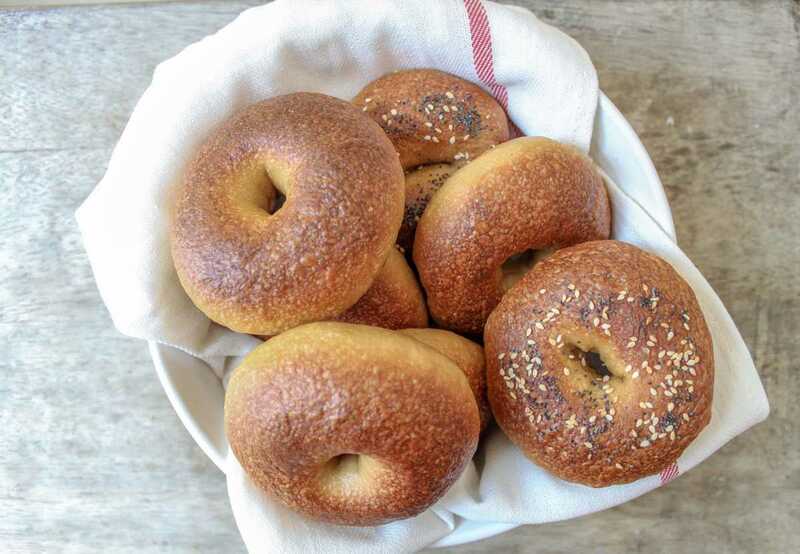 If you’d like to add any toppings to your bagels (poppy seeds, sesame seeds, etc), sprinkle toppings as soon as the bagels come out of the water bath. It is best to brush the tops of the bagel with a little egg white to ensure the toppings adhere. Bake the bagels for 16-18 minutes, until bagels are golden brown. Let bagels cool slightly on a wire rack, then split the bagels in half and enjoy them with cream cheese. I like to take my bagels to the park across the street (at Silver Lake Meadows) and pretend I’m at Central Park while I munch on my delicious snack. In a small bowl, whisk together malt syrup, warm water and yeast. Let sit for 5-10 minutes to allow the yeast to activate. When the mixture is cloudy and foamy it is ready to use. In the bowl of a stand mixer fitted with a dough hook attachment, add flour and salt. Stir until combined. Add all of the yeast mixture to the bowl. Mix on the lowest speed for 3 minutes. Stop mixer and let dough rest for 5 minutes. Continue mixing for another 3 minutes on the lowest speed. At this point the dough should be stiff yet supple. Transfer dough to a clean and lightly oiled bowl. Cover with plastic wrap and let dough rest and rise at room temperature for 1 hour. After the dough has risen, divide the dough into 8 equal pieces. I weighed mine out at 4 oz each. Form each piece into a loose ball. To form the bagels, slightly flattened the ball and poke a hole through the center using your thumb. Using both thumbs, rotate the dough and gradually stretch it to create a hole about 2 inches in diameter. 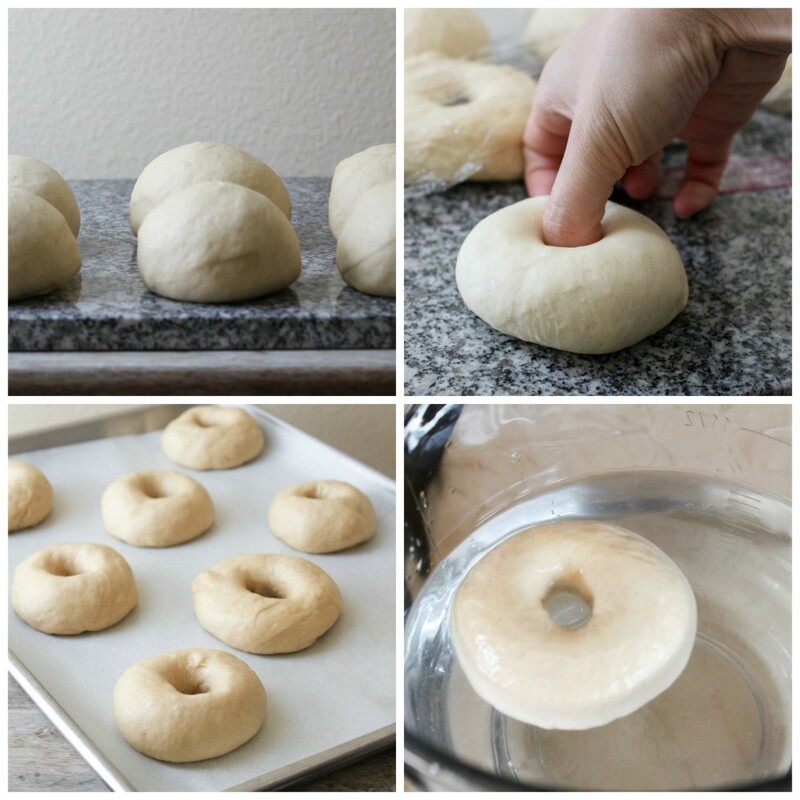 Place each formed bagel onto a greased parchment lined sheet pan. Mist the bagels with oil or cooking spray and cover with plastic wrap. Place the fridge to chill overnight. As you are waiting for the poaching liquid to come to a boil, remove the bagels from the fridge. 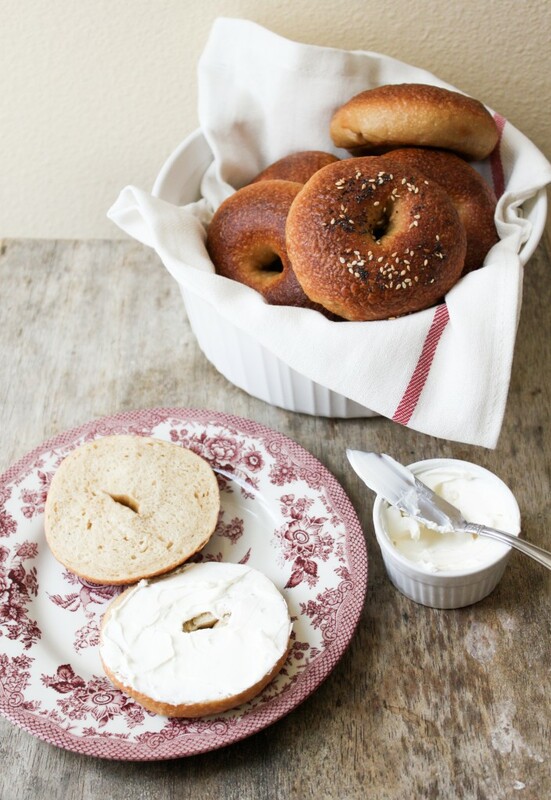 To check if bagels are ready to be cooked, place a bagel in a bowl filled with cold water. If the bagel floats to the surface, it is ready to be boiled. If the bagel sinks, return it back to the pan and let it rest at room temperature for another 15-30 minutes. Preheat oven to 500 degrees F.
Once the bagels have passed the float test, gently lower bagels into the simmering poaching liquid using a slotted spoon. You can add as many bagels can comfortably fit in the pot. Let bagels cook for one minute, then turn each bagel over using the spoon. Let cook for another 45-60 seconds, then remove using slotted spoon. Place bagel, domed side up, to a lightly oiled parchment lined sheet tray. If using toppings, brush domed tops with egg white and sprinkle toppings. 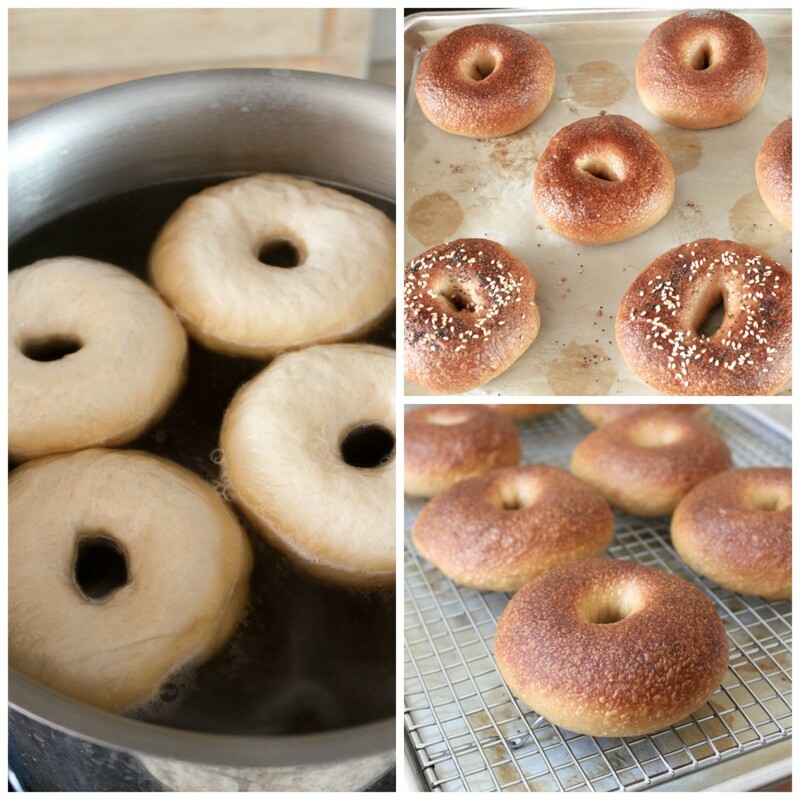 Lower oven temperature to 450 degrees F. Place bagels in the oven and bake for 8 minutes. Rotate pan and check the bottom of the bagels. If they are are browning too much, place another baking tray under the pan. Bake for additional 8-10 minutes until the bagels are a nice, rich golden brown. Cool on wire rack before serving. Your bagels look so good! I would love to make my own bagels, thank you so much for sharing this recipe. Thanks, Rosie! You are very welcome. After making my own, I have a hard time buying them!